The nickname of US Airways is Useless Air, and to a certain extent this is true. When asked 'how to complain about US Airways', many people say "don't bother". This is particularly true if you want compensation for lost luggage, or a cancelled flight. US Airways has a very poor record of addressing customer complaints, answering only 50% of the telephone calls to its customer service department. Note that US Airways always likes to oversell its planes, and oversell by a long way. 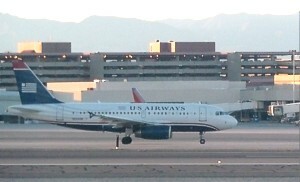 US Airways is the leader in service complaints with 4.4 complaints per 100,000 customers, much higher than Southwest Airlines. Most airlines oversell their planes, assuming that a certain number of passengers will not turn up at the gate, but US Airways excel at this, and there can sometimes by 20 people on standby for each flight. To prevent this happening to you, check in online, and then ensure all your worldly possessions are in your hand luggage, and not checked in. Make sure you get to the gate early - boarding really will commence 30 minutes before the flight departs, and you really need to be there on time. You can sometimes get this to work in your favour, if you are prepared to be flexible, and live like a backpacker. The last flights of the evening are often totally oversold, in which case there is a chance you can get US Airways to pay for a hotel close to an airport you never knew you wanted to stay overnight in. The US Airways website is pretty good, although a lot of the information seems to have been taken straight from legal documents. The Dividend Miles section is particularly hard to understand. Information on Marketplace food menu.